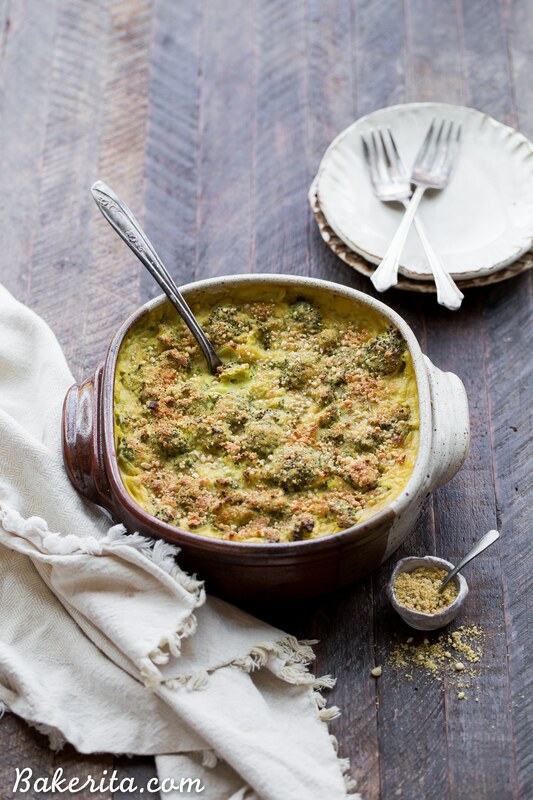 This Vegan Broccoli Gratin has a deliciously rich and “cheesy” sauce and is baked until golden brown on top. It’s the perfect gluten-free and paleo side dish to serve with your Thanksgiving feast, or to enjoy any night of the week. Coming at ya with a Thanksgiving side! Because somehow…we’re already well into November, even though it feels like last Thanksgiving was just a couple months ago. If you’re a planner like me, you’ve already started thinking about and planning out your Thanksgiving menu. I’ve got a note started on my Evernote with all the recipes I want to make linked and a grocery list started at the bottom. My dad and I are plant-based, and my sister, my dad, and I are ALL gluten-free, so while we spend Thanksgiving with my family, we’re left to fend for ourselves food-wise. Thankfully, my sister and dad have ME, who happily takes charge of our gluten-free, vegan Thanksgiving spread. It honestly gives me so much joy to be able to cook a big, hearty meal like this to share with my family, and let’s be honest: I make everything with so much love and flavor that all the meat and gluten eaters in the family are always trying to steal the GF/vegan food. That’s such a win, right?! 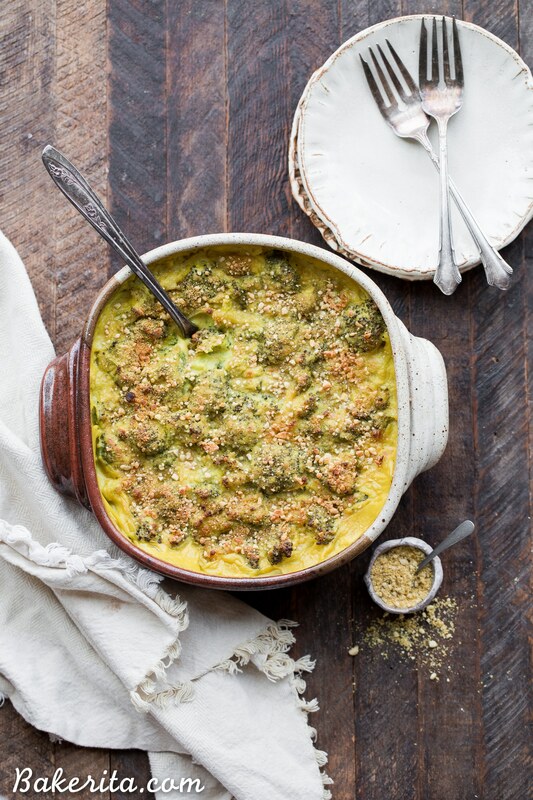 This Vegan Broccoli Gratin was made with everyone in mind – rich and hearty enough that everyone at our Thanksgiving table will want to eat it while staying gluten-free and vegan for us 3 “difficult” eaters. 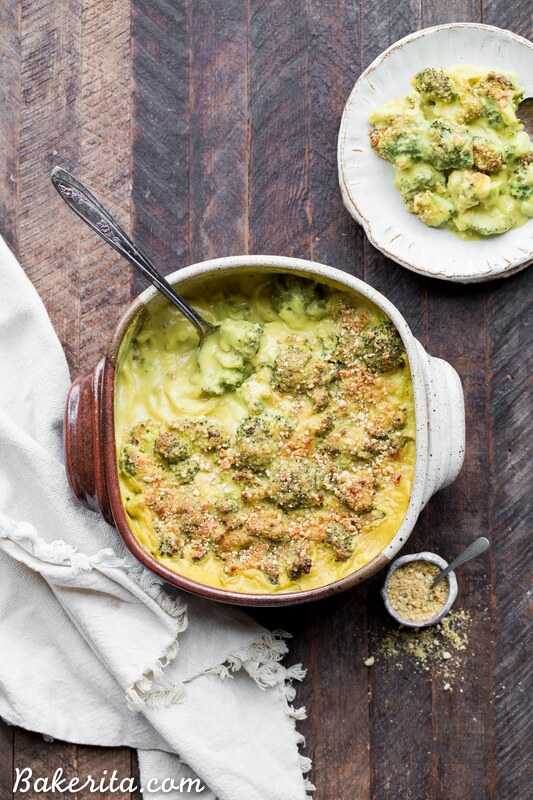 I love a good broccoli dish (hence all the broccoli recipes on my site), and I love it even more when it’s a cheesy broccoli dish. Since it’s been a good long while since I’ve been able to have true cheesy broccoli, I thought I’d go for broccoli smothered in a “cheeze” sauce. The sauce is, shockingly, made from all sorts of veggies. I say shockingly because I think you’d be surprised to learn that if you tasted it. It’s so rich and creamy, thanks to the potato, and full of flavor. It gets some creaminess from cashews and extra cheesy umami flavor from nutritional yeast. 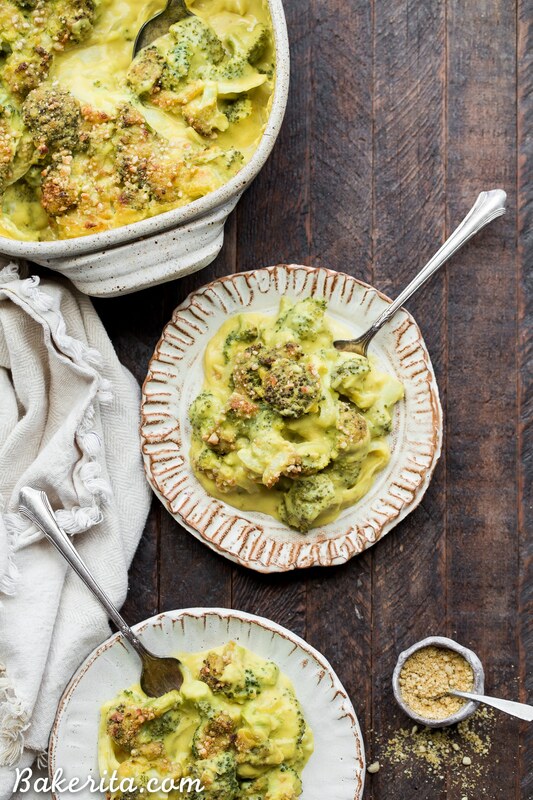 The sauce is combined with broccoli florets, put in a casserole dish, topped with vegan parmesan (my favorite is from Kelly’s Croutons, a local San Diego company that I get from the farmer’s market but you can also order from their site) and baked until crispy and golden brown. 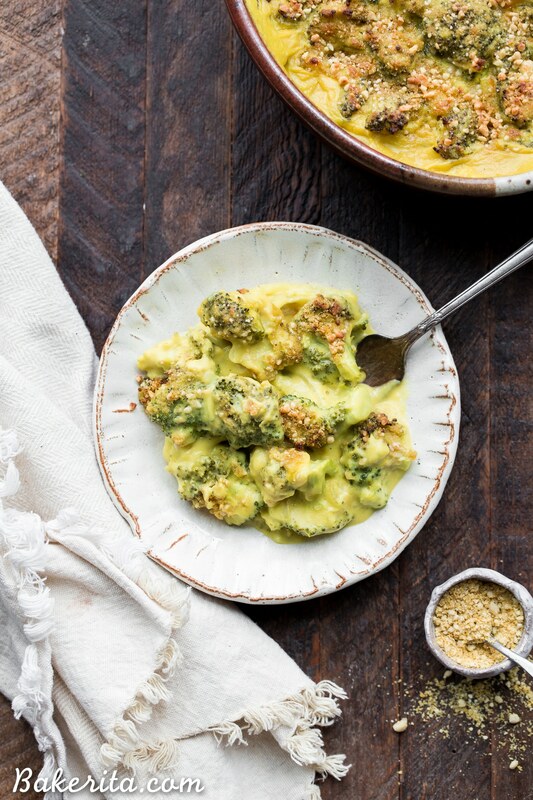 This Vegan Broccoli Gratin has a deliciously rich and "cheesy" sauce and is baked until golden brown on top. It's the perfect gluten-free and paleo side dish to serve with your Thanksgiving feast, or to enjoy any night of the week. Preheat the oven to 350°F and lightly grease an 8 inch baking dish with avocado oil. Bring several cups of water to boil in a small saucepan. Place chopped potato and half of the diced onion in the boiling water and cook for about 15 minutes, or until vegetables are tender and soft enough to blend. When the potatoes and onions are soft, use a slotted spoon to remove them from cooking water, and place them in your blender. Add ¾ cup of that cooking water to your blender, along with the garlic cloves, soaked cashews, dairy-free milk of choice, nutritional yeast, lemon juice, salt, turmeric, paprika, and mustard powder. Blend until smooth. Combine the broccoli florets and the rest of the diced onion in a large mixing bowl and pour sauce over the broccoli. Stir to coat the broccoli and onion in the sauce. Transfer to a greased baking dish, sprinkle with the vegan parmesan, and bake for 30 minutes or until the top is golden brown. Serve hot from the oven. Store any leftovers in an airtight container in the fridge for up to 5 days.